Halestorm returned to Manchester on Wednesday night for a gathering of the freaks in celebration of their recently release 4th album, Vicious. A sold out Manchester Apollo witnessed one of their most impressive headline shows yet with a good dose of new material sitting alongside classics like Mz. Hyde, Love Bites and Apocalyptic. The musicianship on show was incredible, from drawn out jams courtesy of Joe Hottinger, a drum solo with giant drumsticks and one of the most powerful voices on the planet - the kind of voice everyone thinks they have when they’re singing at the top of their lungs in the shower, or car. Lzzy Hale possesses one of those voices in real life and it’s always an absolute pleasure to hear it in a live setting. It took you through all the emotions throughout their hour and a half set, from feeling full of energy and euphoria to feeling tender and vulnerable during a rendition of The Silence or claustrophobic for the intense Black Vultures. Truly fantastic. 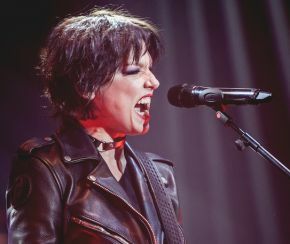 Their star credentials are unquestionable and with Lzzy rocking a Joan Jett look she looked and sounded every bit the icon she is. The number of young female rocks fans in the crowd that she is so obviously inspiring is incredible to see and we’re looking forward to hearing all the bands they form in the future as a result of seeing shows like this one. They way they combined pummeling riffs and singalong choruses was a thing of beauty. Amen had bagfuls of soul to it and Freak Like Me got everyone going. It shows how strong their catalogue is now that they can leave out tracks like Mayhem or I Get Off, which only got an acapella airing as the intro to Do Not Disturb. With only two nights of the tour left, including a night at the famous Brixton Academy we don’t think it will be long before they are back again for another leg, and hopefully a handful of summer festival sets to look forward to too. Check out the new album Vicious.